Routine dining in an ultra-modern setting. 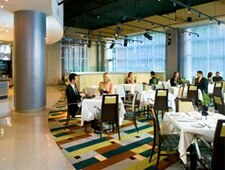 Breakfast & Dinner daily, Lunch Mon.-Fri.
: The contemporary décor is impressive --- all shiny surfaces, glass enclosures and comfortable leather --- but the entrée list is limited to popular dishes such as roasted rack of spring lamb, sautéed sea bass with fruit salsa, grilled pork tenderloin and, of course, the indispensable steak. The dessert list is short but sweet.